Remember Ashley Nell Tipton? Some of you saw her show at FFFWeek. I blogged on her here and here. I've been sitting on my hands awaiting the Spring Collection that would be available to the public for purchase. Well it's finally here. This collection is a mix of flowy garments with feminine accents and textures. 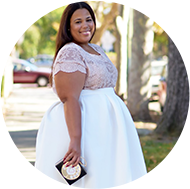 I'm so excited for this designer and I'm pumped that we can add one more fabulous designer to the plus size section. Here's the quick lowdown on the Ashley Nell Tipton Collection: Everything is under $100. Another awesome point is that she offers sizes up to 6X. I often get emails from girls who are still sized out of most plus size clothing. Well this collection is all inclusive. I ordered the Boyfriend Shirt (maxi) dress. I am so excited. Shop the collection here. Obviously the Boyfriend Shirt is my favorite, what's yours? **Update - The first 50 customers will recieve 15% off their order. Coupon code is ANTF50. The long black sheer dress is stunning! Love the boyfriend maxi...cant wait to see you review it! I love the yellow and black dress. It is a very cute collection. oh gosh i just saw it on tumblr! im loving the boyfriend shirt dress! I am in love with the boydriend maxi dress!!! Being that I am on the hunt for a look to rock for my baby shower, this dress would be perfect!!! Can we just say thank goodness for a plus size line with realistic and reasonable prices!!! I looked longer than 5 mins because of the price points. Thanks Chasity for this feature!